Today I have a cool technique to use with Background stamps. Background stamps are useful for creating your own designer paper or to add texture and interest to a project. In the past, you’ve seen me use the Marbled and Hardwood backgrounds. Today I have samples with the Handwritten background stamp. I was surfing some of my fellow demonstrators’ videos on YouTube and found one where France Martin showed how to do the thumping technique with the retired Swallowtail stamp. (To see the video, click here.) I loved the results and wondered if the technique would work with a stamp that didn’t have a specific image but was a true background. The technique involves two steps. First, ink up the stamp with a light colored ink. Smoky Slate, Sahara Sand or even Soft Sea Foam would work well. Next you use markers in a few colors, hold one horizontally over the stamp and let the end drop to pounce the brush end randomly over the stamp adding splats of color. It’s best to start with the lightest color first to minimize the cross contamination effect. Dropping the marker end onto the stamp creates a thump sound. After you have added as much color as you like, huff on the stamp to rewet the ink and then stamp onto glossy paper. Why glossy paper? Well, you’ll see with my samples that glossy paper shows the contrasting ink much more clearly than standard cardstock. Both work, glossy just works better. Here is card number one with the glossy paper. See how the background has Shaded Spruce, Blackberry Bliss, and Crushed Curry accents? I used Sahara Sand as my base ink. 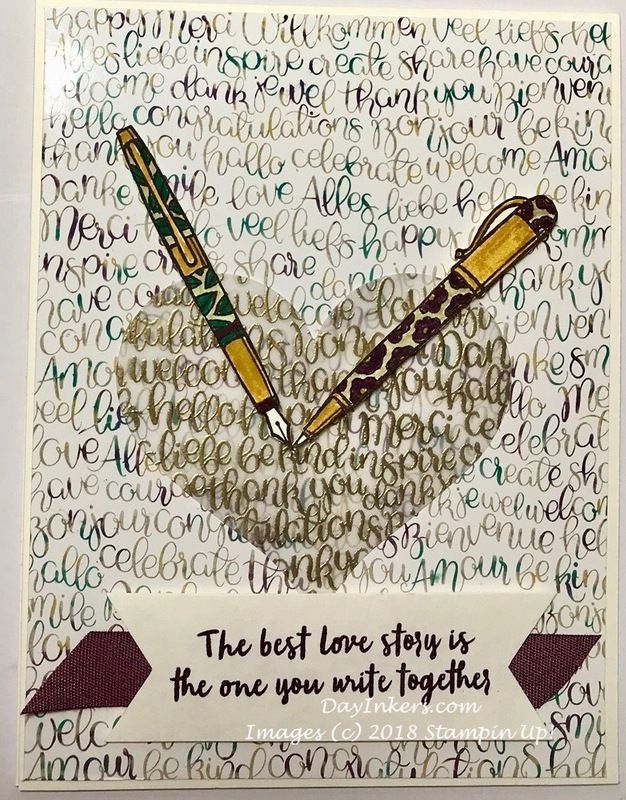 This card was an anniversary card for my husband. The pens are from the Crafting Forever stamp set. I hand colored them with the same assortment of markers I used for thumping and then fussy cut them. They are layered over a vellum heart heat embossed with the Handwritten background stamp in gold. The sentiment is from the retired Oh So Succulent stamp set, stamped in Blackberry Bliss ink. The ribbon was from the Fifth Anniversary Paper Pumpkin kit back in March. I used Thick Very Vanilla as the card base. Yes, my husband loved the card. The next sample is a case of a card by Leanne Johnson. You can see her card here. For this card, I used the same technique and I think the same colors, but instead of glossy paper, I used Very Vanilla cardstock. The sentiment is from Flourishing Phrases. I heat embossed it with copper and added a length of Copper Trim. I like how the card came out, but in the future, I will probably stick with doing the thumping technique on glossy paper or at least Whisper White so that the colors pop. Background stamps are a lot of fun to use. The full assortment of current stamps is on page 172 in the 2018-19 Annual Catalog.